Saudi Arabia’s ambassador to the United States says Iranian commanders and Hezbollah members are in Yemen advising the Houthi rebels. Saudi Arabia’s ambassador to the United States on Thursday said that Iran has been playing a key role in backing the advance of Houthi rebels in Yemen, The Associated Press (AP) reported. 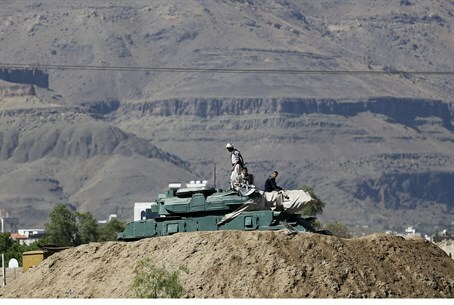 The ambassador, Adel al-Jubeir, said that Iranian Revolutionary Guard officers, as well as operatives from the Iran-backed Lebanese terrorist group Hezbollah, are on the ground in Yemen advising the Houthis. The comments were made as he briefed reporters in the Saudi embassy in Washington. On Wednesday night, Saudi Arabia and a coalition of regional allies launched a military operation in Yemen against the Houthi rebels, who took over the capital Sanaa several months ago and forced President Abd-Rabbu Mansour Hadi to flee to the southern seaport Aden. It is believed that Iran is planning to use the Houthi rebels to take over Yemen and seize the key strategic port of Aden, which controlsthe entrance to the Red Sea and ultimately to the Israeli resort city of Eilat. On Wednesday it was reported that Hadi had fled his palace in Aden as well due to the advance of the Houthis, though government officials denied the reports. Meanwhile on Thursday, Iran threatened that Saudi Arabia’s foray into Yemen would end up costing it dearly. The Saudi “aggression,” said Iran's Foreign Ministry, would “complicate the crisis in the country and kill opportunities for peaceful resolution of the crisis in the Arab country. The smoke of the war in Yemen will reach the eyes of the Saudis."